Caudalie Favorites? Nuh uh — THOMPSON FAVORITES! Just about every staff member working at both stores completely geeked out over this totally-flipping-awesome gift set from Caudalie. 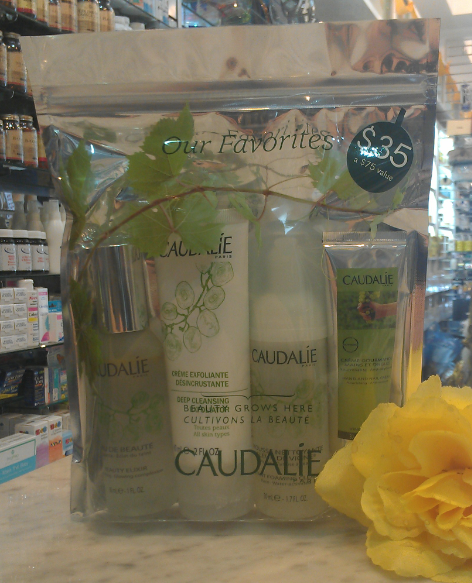 Caudalie calls this totes adorbs set “Caudalie Favorites“, and what a coincidence, ’cause these are THOMPSON favorites! With licorice root, this exfoliator not only has an awesome texture to slough off that gross layer of dead skin cells, but lets you walk away looking cleaner and brighter! Staff Tip: mixing this with an exfoliator makes for a super cool cleanser. Nourishment on the go! This hand cream absorbs into the skin instantly without any traces of grease and comes in a fabulous little tube you’ll be proud to tote around. This is the Caudlie cult favorite. This little spray smoothes fine lines, tightens pores and gives your complexion that boost of radiance.